What was the last sword you purchased for your collection? It was either my customized ArmArt S4 or the Armour Class basket hilt. They came around the same time almost two years ago. I've been too poor since then to buy anything else. That would be my Albion Crecy. Fantastic sword, amazing agility. I really, really like it. I don't have any pics of it, but, of course, the sword is displayed on the Albion website and in Nathan's photo gallery. Actually I bought a really cheap pompeii gladius off ebay, rat tail tang and all. I wanted a scabbard for my Albion Pompeii, and $35 for the scabbard and cheapo sword was a good price! Well, like Nathan, my latest sword was a DT5173 Schiavona. I was curious about the design, and ordered one as soon as I found out that Del Tin was going to introduce the model again. Got a Tinker XVIIIe, blunted for wma. It is awesome! 54" OA. Will post pics as soon as I have access to a dig camera. No, I take that back. I just sent off payment to Australia, for a bronze Canaanite-style Khopesh from Manning Imperial. It's just that the Vince Evans got here first. I was just looking their site over again the other night and noticed some of the ancient weapon types they have there. Really nice looking work. But, then, so is the rest of the work there. Mine would be the Vince Evans D'Arcy Brontosword. A hand-and-a-half. I'm also awaiting a semi-custom from ArmourClass which should arrive very soon. Windlass/MRL falchion-my cheap & chippy chopper. The patina improves every day and I love it! My latest purchase was an Armourclass "S" Baskethilt that purchased used. 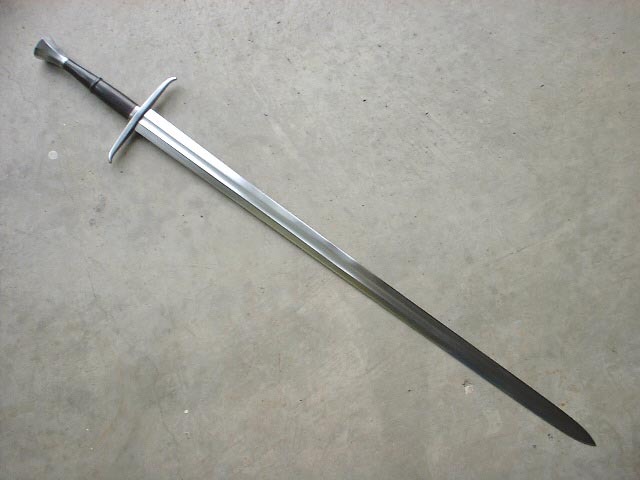 You'll probably recognize the photo below as Patrick Kelly's old sword. He sold it to the guy I bought it from so this is my sword now! And as I haven't taken any new photos of it yet, I'm using his pic. My "S" Hilt basket from Erik Stevenson of Phonenix Metal Creations. This would be the Armour Class Mortuary Hilted sword, which should hopefully arrive around next week. I'll post some pics when I have it. I bought this AT1421 from the SFI Classifieds. A Del Tin 2160 German H&H. I've always liked this sword and couldn't resist a recent one on ebay. Nice grab! That's a beauty and was going for a very good price, but I couldn't convince the CFO to let me bid on it.....turns out she's maxxed out the credit card. P.S. To stay on topic, I'll add that my last (and first sword added to my collection so far) is my lovely Albion Acre I purchased last year. 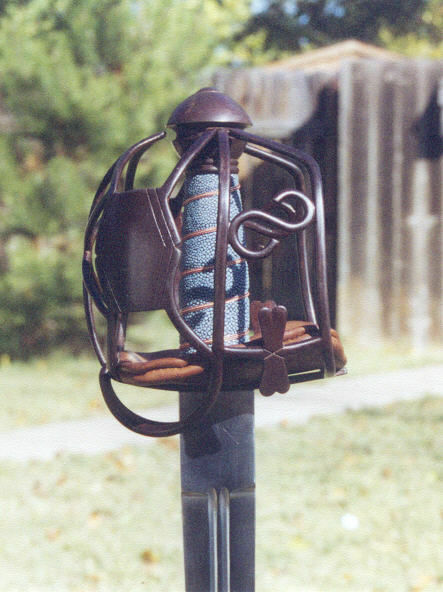 This year's budget went toward an A&A Classic Medieval dagger and a scabbard for my Acre by Art Elwell.